At the end of the Worthing HM. Looking casual but it definitely didn't feel like that. A new personal best for me this week. 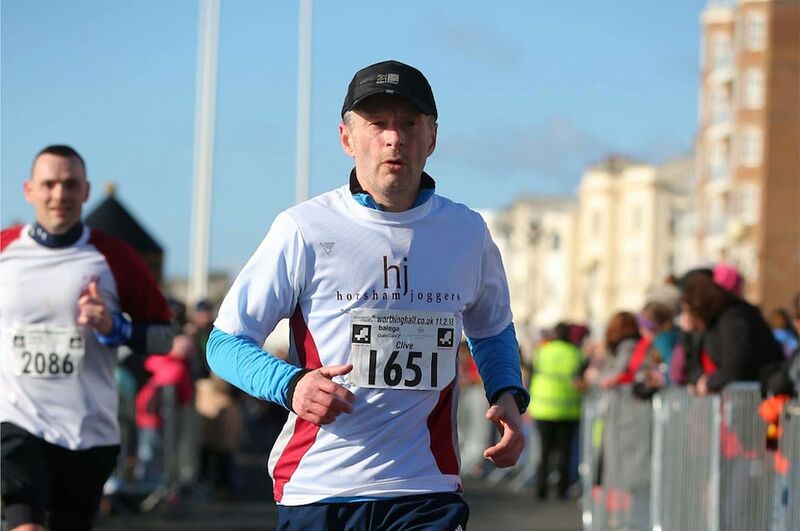 I ran the Worthing Half Marathon in 1:54:08 (chip time) which was a massive half marathon PB ….. by 15 seconds. But, 15 seconds is still a PB! 15 seconds is still a PB! A strong finish feels so much better than dragging your feet over the line. Worthing was a much better race. And I think I ran it the best I could. I started at ~ 8:50/mile, which was actually a tad faster than planned, and then ran very consistent ~ 8:45 mile splits for the whole course. It’s not exactly a sprint finish but I ran the last mile closer to 8 minutes. That strong finish is something I want to do every race. A strong finish feels so much better than dragging your feet over the line. It was difficult to run my own race at the beginning because lots of runners went past me (I was near the front of the mass start). Hopefully, I caught up with a few later on in the race but keeping to ‘my pace’ was difficult. The course is completely flat. It winds through the streets of Worthing for the first seven miles. Someone described it as like running in an Etch-A-Sketch because the route goes back and forth in the town for an hour or so. After that, it’s out along the sea front, heading west for three miles to a turning point followed by a final three miles to the finish with the wind behind! Here’s my race on Strava. Check out the route! The three mile westerly section was the most difficult. Running into a headwind when you have done seven miles isn’t at all easy but I was able to overtake a few other runners and this gave me fresh motivation. It seemed a long way to the turning point though. Every time I saw a roundabout ahead, I thought “that must be it” … only to find another section before the final miles. I felt tired but strong in the final mile. Good job I ran it as fast as I could to make up those 15 seconds! I ate porridge for breakfast and an energy gel before the start. I munched on a few dates during the run and I think they definitely helped (possibly only psychologically). Otherwise though, I ran without water bottle, because that’s what I have done in training, and only carried a spare energy gel. I did make a conscious effort to slow down and actually drink half a cup of water at every water stop. For me, this was better than carrying a water bottle. This nutrition ‘strategy’ worked for me but everyone has a different approach. Many thanks to Stephen Entecott (who I’ve run a few training runs with) for giving me a lift to Worthing. I’m glad I didn’t try and keep up with him though, he ran 4 or 5 minutes faster than in training. Great running! Overall, the race was very well organised. Water stops every 3-4 miles. An indoor meeting point in the Pavilion Theatre at the start. Announcements about how long it would take to walk to the start. Thank you folks. I’m looking forward to my next Half Marathon now. It’s the Run Gatwick Half in May. I’m having a rest Sunday today but hope to be back with longer runs next weekend.